'There Are Places I Remember': "Bring Your Flash"
On a more humorous note, this happened 55 years ago today. Following a Sunday night engagement at the ABC Theatre in Blackpool the Beatles returned to Liverpool, where they spent the next day visiting friends and family. Tuesday 16 July - The Beatles recorded 3 episodes of their 'Pop Go The Beatles' radio show at the BBC Paris Studio in London - a total of 18 different songs. They'd actually arrived late for the 10.30am session which suggests they left Liverpool later than expected. Wednesday 17 July - Still in that London the Beatles recorded another BBC radio session, this time for the 'Easy Beat' show at the Playhouse Theatre. Thursday 18 July - The Beatles commenced recording sessions for their second album (to be titled 'With The Beatles') at EMI Studio 2 in Abbey Road, London. The songs were You Really Got A Hold On Me, Money (That's What I Want), Devil In Her Heart, and 'Till There Was You, all cover versions from their Cavern repertoire. Friday 19 and Saturday 20 July - The Beatles performed at two sold out shows in the Ritz Ballroom, Rhyl, North Wales (which I've covered in an earlier blog). But back to Monday 15 July 1963. At some point during the day George and John were together at 'Mendips' visiting Mimi, Cynthia and three-month old Julian. We know this because they brought a portable tape recorder with them and recorded six minutes of themselves chatting while an album played in the background. You can hear George discussing their upcoming schedule for the week with Cynthia, telling her that on Thursday they'll be recording a show for broadcast on Sunday and they'll have to wear suits (for radio!) because it's in front of a live audience. This is the show 'Easy Beat' which they actually recorded on the Wednesday. He also confirms that they're travelling to London tomorrow and will be there until Thursday. As noted above, on the Friday they appeared in Wales. 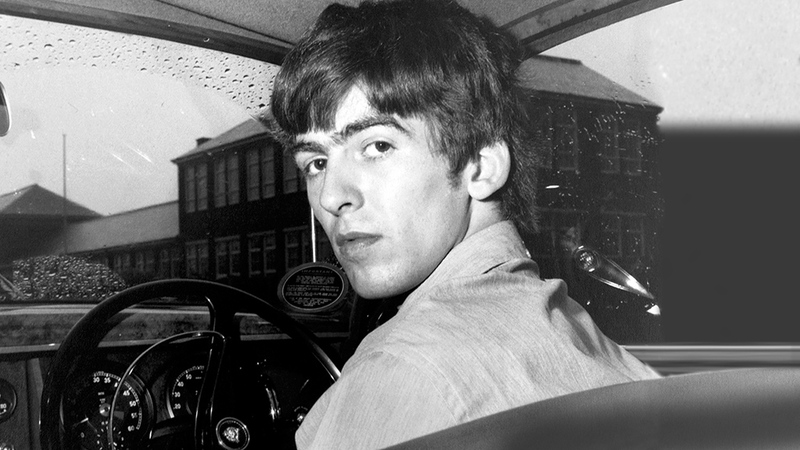 The tape was among those left in the possession of the Beatles' chauffeur Alf Bicknell which later found its way onto a bootleg CD entitled Maybe You Can Drive My Car. 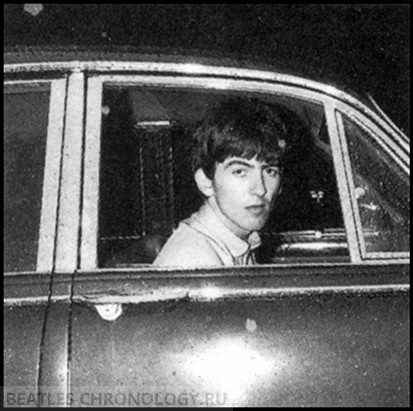 Talking of cars, what George did next that day was also captured for posterity. Just under a year after buying the Ford Anglia Harrison was making some good money and could afford to trade it in for a flash Jaguar Mark 2. 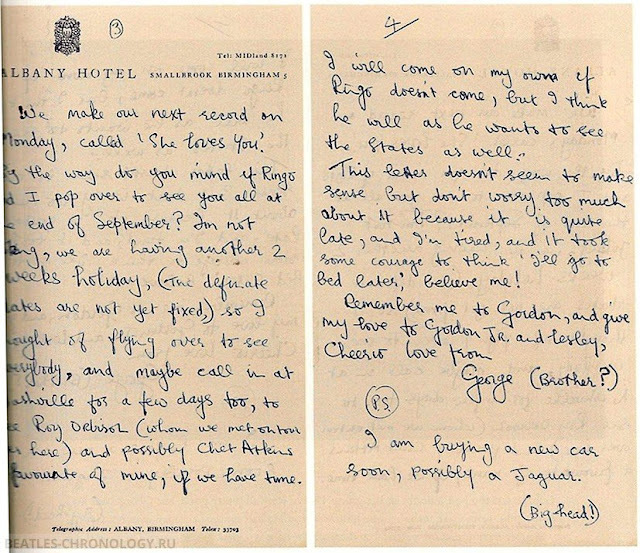 On 29 June 1963 George wrote to his sister Louise who was living in Benton, Illinois. 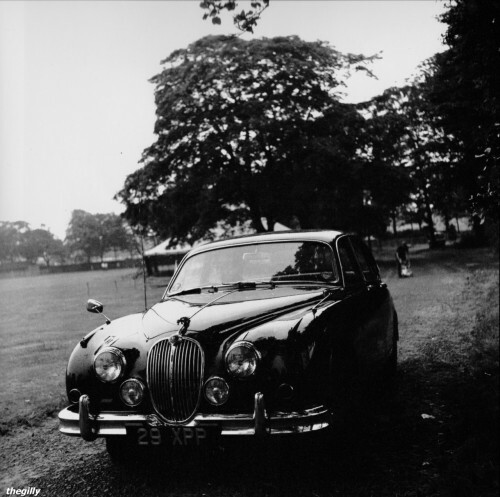 In his final PS he wrote 'I am buying a new car soon, possibly a Jaguar (Big-head!) which he did within two weeks of writing the letter. He may actually have acquired it on the 15 July as he had very few days off in the fortnight leading up to it - for almost one week he was playing a season in Margate. In any event, having shown off his new wheels to his parents and neighbours on Mackets Lane he wasted no time in driving over to Forthlin Road where he knew he'd find Mike McCartney, and more importantly, Mike's camera. Mike recalls the night in his book Remember: When he knocked at our Allerton front door demanding photos of his latest acquisiton I protested ' but George, it's getting dark'. 'Bring your flash' came the reply. 'And it's raining!' I added. 'Bring your umbrella,' he finalised. And so, they went for a little drive around the area, George, Mike and Tony Bramwell according to the man himself. ...before pausing on Heath Road, outside what is now the Bridge Chapel centre. Me in a 2017 recreation. I had to wait until it was raining to get that moody authenticity! .... before ending up on the approach road to Allerton Golf Course*, just as they had in August 1962 when George aquired the Anglia. 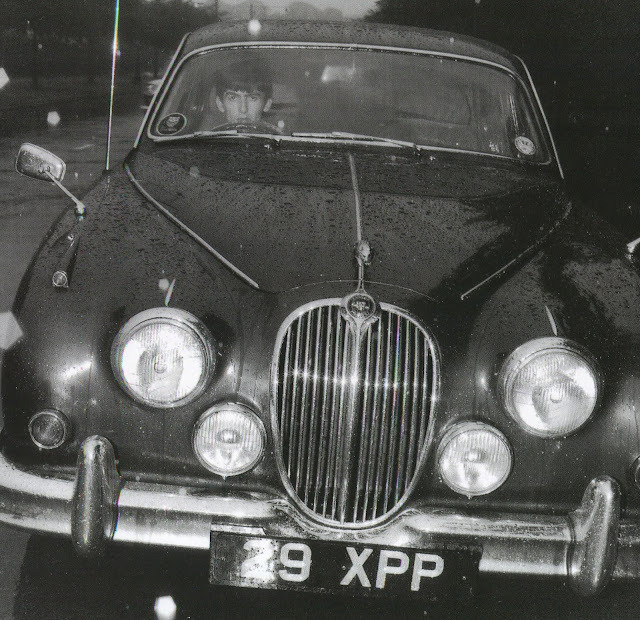 Both cars had been obtained through a friend of Brian Epstein called Terry Doran who had a garage out in Warrington, George returned the Anglia to Doran and traded it in for the Jaguar. * Though to me this could equally be one of the entrances to Camp Hill off Hillfoot Road, Woolton. The tragic death of Julia Lennon: 60 Years on.